Registration Opens for the Orientation Program in Province Three! With the successful orientation in province 1, we are pleased to announce the second series to be held in province 3! 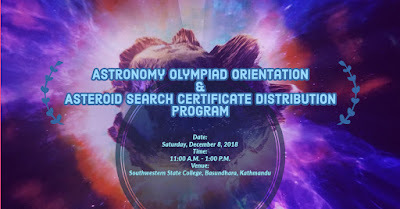 Students who are in high school level and would like to learn more about our asteroid search and astronomy olympiad program can join us at Southwestern State College, Basundhara, Kathmandu on Saturday, December 8, 2018! Registration is free and remains open till until before midnight, Friday, December 7, 2018! The program will provide participants with first-hand information on our asteroid search program and national astronomy program in person. Participants will also get the latest updates about these programs at the orientation. All-Nepal Asteroid Search Campaign (ANASC) is a hands-on astronomy program for the high school students with a unique opportunity to make original discoveries of asteroids. It provides high-quality data to the students to get the taste of astronomical research and discoveries. Prior to each search campaign, two-day workshop is organized in order to familiarize students in a campaign for their successful discoveries!